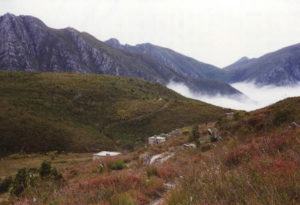 Boosmansbos Nature Reserve straddles the Langeberg Mountains. It lies north of Heidelberg, east of Swellendam and south-east of Barrydale in the Little Karoo, and protects the last remaining afro-montane forest in the range. Said forest has remained untouched because of its remoteness, and these mountains certainly are forbidding, but beautiful. The Boosman (the angry man) was apparently a hermit who lived high in the range, selling wild honey and wood to surrounding towns and farms. Saturday involved a long, winding trudge up the western slope of the Duiwenhoks River valley. At times the mist and cloud receded to reveal majestic peaks and deep, dark kloofs, but mostly we walked in mist. However, after we broached the saddle to follow the contour on the northern aspect of the range, the weather suddenly cleared to reveal the Little Karoo, Barrydale and the intervening valleys. Our stay in the stone huts of Helderfontein was notable for another memorable feast prepared by Lorette and Charlotte. Sunday dawned clear and crisp, and some of us decided to take the short walk to Boosmansbos, before departing. By the time we returned from the old forest, the tongues of mist were creeping up the kloofs, and when we hit Barend Koen’s logging road, we were engulfed in the wet, but warm, fog. The views must be awesome, but our route down the road was like walking in a tunnel of mist paved with loose clumps of sandstone. At least we were forced to concentrate on the surrounding fynbos, but wet feet, the downgrade and the compacted road were making walking difficult. Somewhere between Helderfontein and Saagkuilskloof, Big Ron mislaid his legendary sense of humour – and then we suddenly emerged out of the mist into the stunning Duiwenhoks kloof. All was well again as we climbed out of the kloof along a path which hugs the kloof wall. I’d like to know the story behind that path, as it is not a hiking path, but a narrow pass with small cuts and stone fills. My guess is a logging path for horses.